Pro-Cut FAST Leaf Trimmer - ON SALE! - FREE Shipping! Why spend many hours hand trimming when the Pro-Cut Fast HD leaf trimmer can work through your harvest in no time? Pro-Cuts’ trimmers are MADE IN CANADA of high grade stainless steel and feature food grade components. None of the leaf trimmers on the market has the harvesting performance or clean flower trimming cuts of the original Pro-Cut Fast HD leaf trimmer. 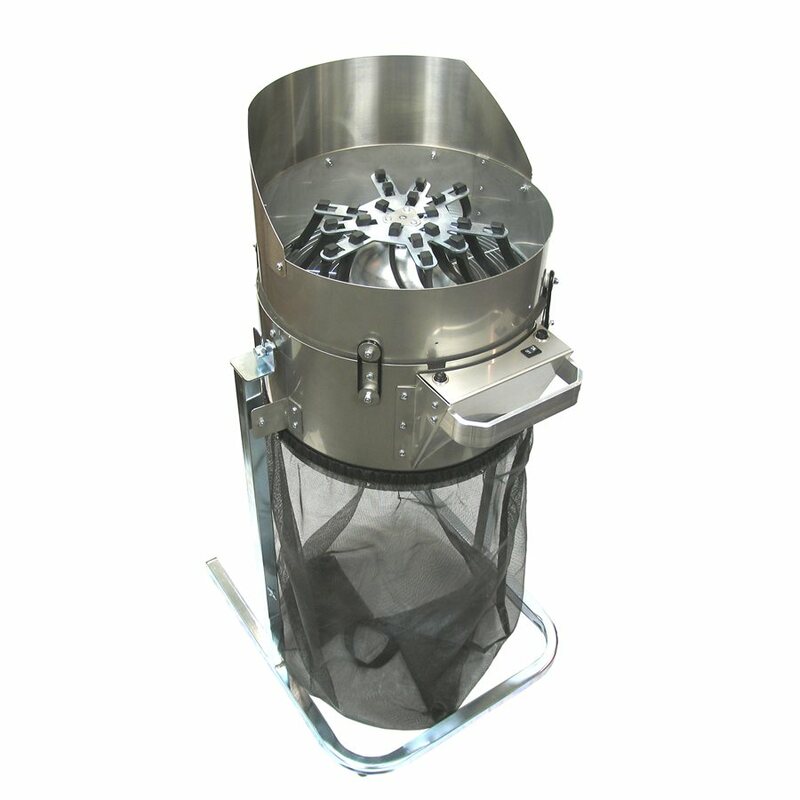 Engineered for wet trimming, the Pro-Cut Fast HD leaf trimmer consists of a two piece, stainless steel drum style casing, installed on a sturdy stainless steel frame. When in use, the open bottom of the drum gathers the unwanted trim material into a mesh bag, making for a simple clean up. Food-grade rubber fingers gently manipulate the plant material across the Pro-Cut Fast HD leaf trimmers’ grille. Also made of stainless steel, the trim grille allows stems and leaves to pass through to the precision hardened stainless steel trimming blade while protecting your flower buds. The nicely trimmed buds remain on top of the grille and the scraps gather in the included mesh bag beneath the leaf trimmer. When done, the fill-and-spill recovery system easily tilts forward to spill out the flowers. Powered Pro-Cut trimmers exclusively use USA built motors. If the unexpected happens, all Pro-Cut trimmer replacement parts are readily available to ship. To remove sticky plant matter and resin from your Pro-Cut trimmer, we recommend Cedar Magic or Fast Green cleaner. These all natural cleaners easily cut through grease, tar, and resin. No need to worry about dangerous chemical residue or contaminants reaching your harvest. They also conceal odors, smell great, and are good for your skin! The heavy-duty 1/10HP direct drive motor is a quiet and reliable workhorse. Using standard household current, the Pro-Cut Fast HD trimmer trims effortlessly and produces great results in very little time.